William Burges (1827-1881) disliked Georgian furniture of the 18th and early 19th centuries. This washstand, designed by him, epitomises how he thought furniture should look. Brightly painted, using rich materials and with complex fitments and references to literature and myth, the washstand was nonetheless highly functional. It has a water tank in the upper castellated section with a tap. The marble basin, inlaid with silver fish motifs, is fitted with a tap in the form of a bronze animal. The basin swivels so that the dirty water can be tipped into a bucket in the cupboard below. The Tower House, in Melbury Road, London, was the home of Burges from 1878 until his death in 1881. He designed every aspect of the house himself. The outside of the house was in the Reformed Gothic style, while the inside was decorated in the most elaborate fashion. 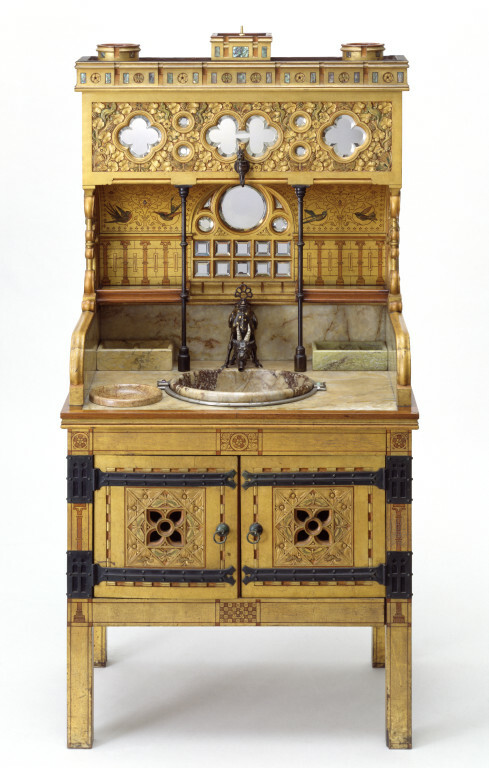 This washstand was made for the Guest Chamber, of which a visitor wrote, 'The whole chamber is like an ancient shrine or reliquary'. William Burges was an architect as well as a designer of furniture, metalwork and jewellery. His most important projects include Cardiff Castle and Castell Coch, near Cardiff, in Wales. His style was heavily influenced by medieval art. He never married, was a freemason and a collector of armour, and was described by the wife of his patron as 'ugly Burges who designs lovely things'. The marble bowl is inset with silver fishes and a butterfly. 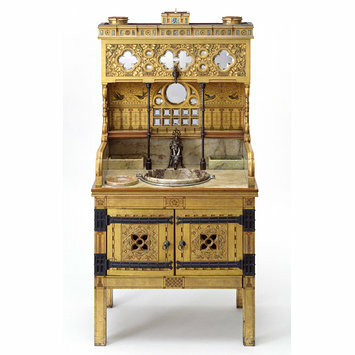 The washstand was designed by William Burges (born in London, 1827, died there in 1881) and made in London for the Guest Bedroom at Tower House, Burges's home in Kensington. Burges's Estimate Book (National Art Library 86.SS.52) includes a reference to a washstand for himself, on 2nd October, 1879, made by a carpenter, John Walden, at a cost of £50. Washstand, carved painted and gilt wood, with marble bowl inset with silver fishes and a butterfly. English, 1880. Designed by William Burges. The top, bowl and soap dishes of marble. The bowl inset with silver fishes and a butterfly. The back and water tank set with small mirrors and the taps and fittings of bronze. Inscribed VENEZ LAVER (on cold tap), VITA NOVA (on back), WILLIAM BURGES (left side), and ME FECIT MDCCCLXXX (right side). Designed for the guest chamber, Tower House, Melbury Road, London, W14.